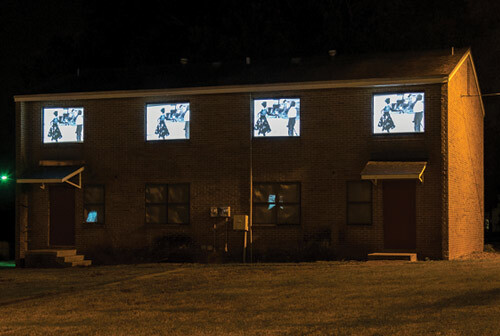 Spartanburg, SC – Feb 1st, 2017- Join the Chapman Cultural Center for two intimate opportunities to learn about how Spartanburg came together with international artist Erwin Redl on “Seeing Spartanburg in a New Light.” The City’s ambitious public art project, winner of the Bloomberg Philanthropies Public Art Challenge, spanned ten neighborhoods with nine installations. On Thursday, February 16th from 6-8pm the public is invited to attend a panel discussion with internationally renowned artist, Erwin Redl, and the Seeing Spartanburg in a New Light Creative Team. The panel will share their professional roles and experiences from the design and installation of the light exhibits to generating programming during the exhibition. On Friday, February 17th at 6:00pm, Erwin Redl will lead a special guided tour for museum and art professionals. The artist will speak about his process and materials for each of the nine works of art within Seeing Spartanburg in a New Light. Guests can view short informative films about the project and the artist, learn more about Redl and the exhibitions he has participated in around the globe and see the media-based tools and materials he uses in his work as well as the specific components used in this project. After the guided tour with the artist, guests will enjoy a light reception at the Visitor’s Center located inside Chapman Cultural Center. The Visitor’s Center, designed and developed by Spartanburg Art Museum, provides a space for people to learn about the Bloomberg Philanthropies Public Art Challenge, which challenged cities to think of creative ways to engage communities with art, the necessary partnerships needed between the arts and law enforcement, and it provides details about each of the nine art installations as well. “I hope to meet many new peers and colleagues at these events, which were designed to connect community members and professionals in the creative world who share an interest in the transformative nature of public art,” said Elizabeth Goddard who served as Associate Curator for the project.